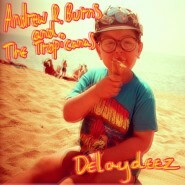 Second ep from the wonderful Andrew R. Burns & The Tropicanas. The band have been attracting an impressive range of admirers including Tom Ravenscroft (BBC Radio 6 Music), Roddy Hart (BBC Radio Scotland), British Council show The Selector, the Daily Record and Song By Toad. Released Sunday 18th October 2015, available from itunes and all major digital stores, including our bandcamp store.